Bring back the lost art of letter writing with Inkspirations Color and Connect postcards. You'll de-stress and enjoy the fun of coloring while keeping in touch. In a time when many people use cursors instead of cursive, your friends and family will appreciate receiving a personal note that's your own work of art. With a wide variety of original designs from artist Ronnie Walter, there is something for every budding artist, from gorgeous geometric designs and fabulous florals to pretty paisleys and funky flamingos. Thinking of You, Thank You, and Birthday messages await your artistry, plus more than two dozen message-free postcards to make your own. With a sturdy card stock and a compact size that's durable for postal mail, it's coloring fun turned functional, a creative and personalized way to keep in touch. 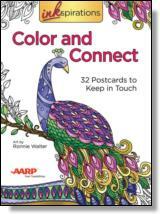 AARP and HCI come together with a special line of Inkspirations adult coloring books that are good for us emotionally, physically, and spiritually.